Aleksandra Mizielin´ ska and Daniel Mizielin´ ski graduated from the Academy of Fine Arts in Warsaw, Poland, in 2007. In 2010 they were nominated for the Bologna Ragazzi Award and the IBBY Honor List. [F]eatures playful line drawings of national and geographical attributes, including famous native folk (Freud, Kandinsky, Count Dracula). ... [A]n entertaining and informative choice for budding geographers or Eurail travelers-to-be. [A] delight to explore, as the Mizielinskis fill their maps with tiny labeled images of local wildlife, cuisine, activities, and notable citizens... Compelling. Handsomely detailed illustrations include major industries, regional insects, birds, fish, and other animals, plants, crops and prepared food, and famous people. ... This book supports and encourages geographic literacy. [R]ewarding fare ... for both young cartografiends and armchair travelers. This handsome and fun-to-browse volume will inspire armchair travelers. ... The artwork’s muted earth tones, decorative borders, and fine-lined drawings are reminiscent of an antique rendering, while the numerous small cartoon illustrations add a light, contemporary touch. ... [W]insome renderings. At once a celebration of diversity and an investigation of the natural and cultural offerings that make each country unique, this expansive and impressive book of maps ... is richly detailed with dozens of extraordinary drawings... Hours of fascinating perusal await. There is no dearth of atlases for children, but Aleksandra and Daniel Mizielinski's "Maps" is a standout. ... [The authors'] enthusiasm and love for facts kids might want to know shine forth in charming little illustrations. [A] sumptuous illustrated children's atlas that combines chic, muted colors with witty and informative drawings on heavy matte paper that whispers under the fingers. ... 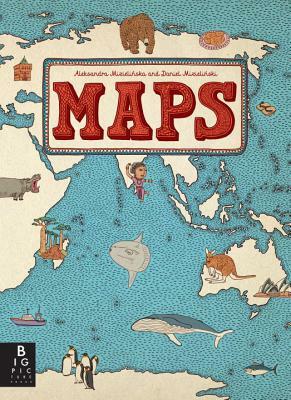 The sort of book you can't help touching, "Maps" is as likely to engross adults as it is 7- to 10-year-olds. ... [I]t gives aesthetic pleasure all the way from the table of contents to the flags of the world at book's end. [A] nonfiction visual feast... [G]loriously portrays the world's profusion of creatures, mountains and man-made structures in chic, subdued shades of beige, mauve and eau de Nil. A visual extravaganza with fascinating trivia in pages as spacious and luxurious as a classic road atlas. It's an invitation to travel around the world one page at a time. ... "Maps" is a treat, with its richness of details catering to young readers in this electronic age who thrive on all kinds of visual stimuli. This book will also appeal to other members of the family. All will scour for details and trivia as obscure, fun and varied as where one might sandboard or see a yak. Along with geographical features and pictures, you'll find amusing depictions of indigenous animals, native dress and characteristic architecture... Between the buildings, food and history, the maps will awaken a wanderlust for unfamiliar and exotic locale. Not exactly your library’s world atlas. These maps, illustrated in distinctive style by the authors, denote the culture and history of a place rather than its exact coordinates.